It’s sometimes easy to forget in the suburbs of Dunedin that we are all adhered to the shaky side of a remote, isolated island chain, a spiky anchor at the far southern heel of the archipelagoes of Polynesia. We are inhabitants less of the land than of the great bowl of the Pacific, whose blue orb is the largest single feature of a planet somewhat inaccurately named Earth. Simon Winchester has not attempted an encyclopaedic approach to his work, for obvious reasons. The Pacific Ocean contains multitudes. He has wisely (and entirely successfully) collected, or perhaps curated, a series of snapshots of the intersection of humanity with the ecology and geography we make our lives within. Within these constraints, he captures a fine sense of the whole. His previous book, Atlantic, was a fantastic read: illuminating, informative, dramatic. What made it most rewarding was the author’s dry humour, and sense of the absurd, leavened by a great sympathy for the human-scale trials and tribulations of those who have lived on and around that other vast ocean. Could he do it again with Pacific? 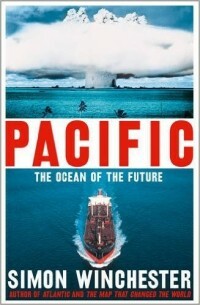 Equally compelling and a worthy companion volume, Pacific is structured around a series of loosely connected chapters, dealing with events starting from January 1, 1950 (the reason for this can be found in the book). Each chapter deals with an aspect of his topic, including nuclear testing and its dire effects, the genesis of Japanese consumer electronics, a history of surfing, the tensions on the Korean Peninsula, the decolonisation of Southeast Asia, the Pacific weather systems and climate change, Australia’s politics and society, volcanic vents in the abyssal deep, the Great Barrier Reef, and the militarisation of the Pacific by the United States and its new rival China. In each of these sections, the author develops his themes in a discursive way, delving back into history, mulling on the future, diverting down curious byways. He is just as adept at providing a potted explanation of El Nino as recounting the cultural politics behind the development of the Sydney Opera House. In all, the human factor is always there, and the author brings the eye of a novelist to his narrative. It would be a strange person who would not be moved and inspired by the grand picture he has created. Above all, what comes through is the sense of wonder, and love and respect, for the Pacific Ocean, its ecology, and its diverse peoples: Asian, Pacific, European, indigenous and colonial. As he notes, this is an “Ocean of the Future”. And we are very much part of it.